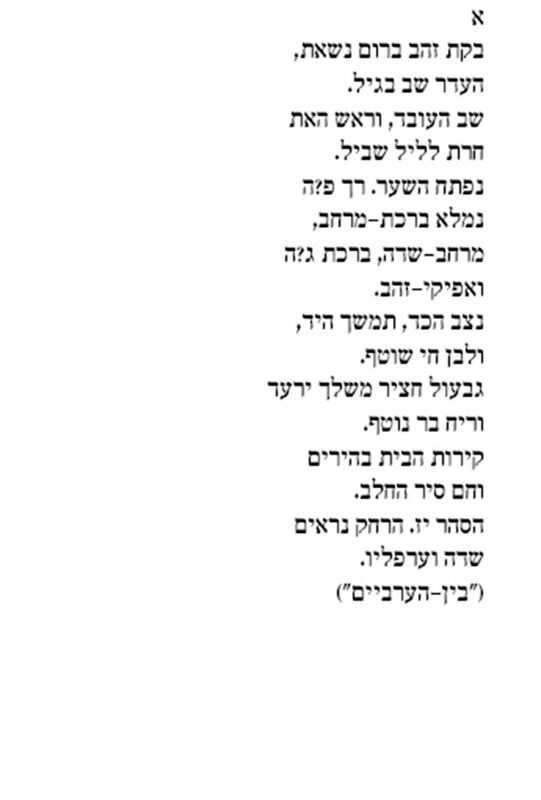 On warm milk and mists: Respite from the madness in a tranquil Hebrew poem from the early 1900s. The flock heads home with glee. Engraves a pathway for the eve. The space of fields, a garden’s grace. The crescent moves. Streambeds of gold. For the flowing, living white. Emits the fragrance of the wild. And warm the pan of milk. A field and all its mists. An earlier version of this translation from Hebrew by Vivian Eden was published in Haaretz magazine, November 3, 2000. It is tranquil in part because it is devoid of explicit human emotion – only the sheep evince “glee.” The unidentified speaker (there is no "I," nor is there a “you”) doesn’t comment, but just shows: Everything is visual rather than visceral and everything is silent – even the splash of milk is depicted as a sight – a curve – rather than as a sound. “Gold,” “head home,” “space,” field” and “crescent” each appear twice, in tidy and soothing repetition. The first three quatrains contain closed pictures from different perspectives: from a distance, from the yard of the home and inside the home, while the fourth quatrain opens out again from indoors to the distance again, suggesting a rhythm of pleasing routine. Abraham Solodar (1890-1936) was born in a shtetl in what is now Ukraine. As a young adult in Odessa, he made the acquaintance of some key figures of nascent modern Hebrew literature, among them Hayyim Nahman Bialik. After a brief period in Vilna, he came to Palestine in 1911, qualified at the teachers’ seminary in Jerusalem, worked in Tel Aviv for a while and moved as a teacher to the Galilee agricultural village of Yesud Hamaala. In 1926, leaving his wife and two sons in Palestine, he went to the United States, where he taught at Jewish institutions, completed a master’s degree at Northwestern University and patented a method for Hebrew linotype printing. According to his obituary in The New York Times, he died in Chicago while translating Walt Whitman’s “Leaves of Grass” into Hebrew. And so no man understands any greatness or goodness but his own, or the indication of his own.